Home Depot today announced a chemical hazard avoidance policy that will prohibit numerous toxic chemicals in paints, carpeting, flooring and fiberglass insulation products. The Home Depot Chemical Strategy, included in its 2017 Responsibility Report, targets a range of chemicals known or suspected to cause cancer, mimic and disrupt hormone systems, and impair brain function. The retailer's policies, for certain product categories, far exceed the chemical restrictions of LEED and most product certifications in these categories. The world's largest retailer of building products credited HBN's "guidance on priority chemicals and innovation" as it adopted many of the recommendations made by HBN and other environmental health groups in a dialogue begun in 2014. By applying its chemical strategy to all products in target categories, Home Depot makes important strides toward equity in the green building movement. It tracks many of the recommendations HBN provides to the affordable housing community in our HomeFree initiative. Because it impacts products at all price points, not just premium products and not just those that qualify for the retailer's Eco-Options program, the policy ensures that all contractors and do-it-yourself customers get healthier products regardless of the brand purchased, and regardless of whether or not the product has been certified "green." One of the qualifying products, a flat sheen paint, is the first "zero VOC" paint priced under $20 per gallon. "We're not just sourcing new healthier products, we are striving to improve our current assortment of the products we already sell," Ron Jarvis, Home Depot Vice President of Merchandising and Sustainability, told HBN. Home Depot's most significant advances are in reducing toxic hazards in carpets and paints. The new carpet policy implements two major recommendations of HBN's newest report, Eliminating Toxics In Carpet: Lessons For The Future of Recycling. published last week. As we reported, Shaw Industries - the country's largest carpet manufacturer - recently stopped using fly ash from coal-fired power plants as filler. Today, Home Depot announced that fly ash, which contains toxic heavy metals, is "excluded from indoor wall-to-wall carpet in our U.S. and Canada stores." 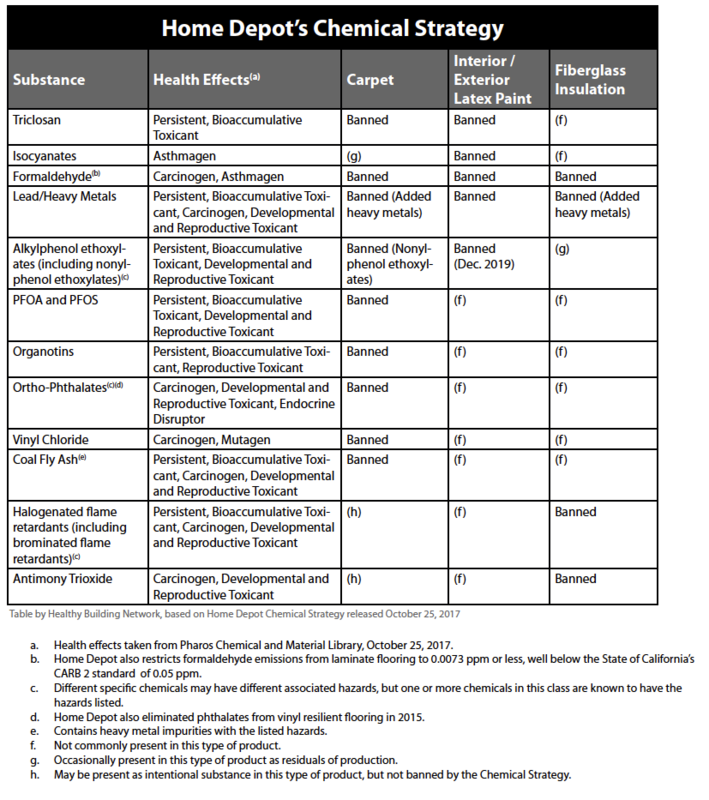 Home Depot also announced its carpet does not contain several other chemicals that HBN has prioritized for elimination, including ortho-phthalates and organotins used in carpet backings. Home Depot will also eliminate a class of toxic chemicals from paints called alkylphenol ethoxylates (APEOs). These chemicals, which are present even in low VOC paints, are surfactants, which help different types of material mix together well, and are coming under increased scrutiny as hormone disrupting chemicals with health effects ranging from breast cancer, reproductive disorders and obesity. They are mostly phased-out in Europe and Japan, but still common in the U.S., even though the EPA has identified over 200 "safer surfactants" to replace them. However, the hazard avoidance approach of the Home Depot Chemical Strategy (available here) signals fundamental, permanent and systemic improvement in the building products industry, and is a strong step towards health equity in building products. It leans toward a future when "healthy products" are not sold for a premium or as specialty items, and any product on the shelf meets the reasonable consumer expectations that it is healthy for people and our planet. For further HBN analysis of this strategy, please visit our Pharos Signal blog. Glidden Premium flat sheen white begins at $17.97: https://www.homedepot.com/b/Paint-Paint-Colors/Glidden-Premium/Interior-Paint/N-5yc1vZcaw8Z55aZ1z0q3xf. While there are some paints available in the US that are free of these chemicals, including product lines from Benjamin Moore and Sherwin Williams. Home Depot is the first major paint seller to prohibit them in all formulations offered for sale, affecting most of the formulas sold today and all sales by December 2019.